Narrated by Amal Bhakta Dasa. Approximately 47 hours and 35 minutes. Release date 1990. When He approached Mathura and saw the city, He immediately fell to the ground and offered obeisances with great ecstatic love. When Sri Chaitanya Mahaprabhu entered the city of Mathura, He took His bath at Vishrama-ghata. He then visited the birthplace of Krishna and saw the Deity named Keshavaji He offered His respectful obeisances to this Deity. At the present moment, the temple of Keshavaji is very much improved. At one time, Keshavaji-mandira was attacked by the emperor Aurangzeb, who constructed such a big mosque there that the temple of Keshavaji was insignificant in comparison. But with the help of many rich Marwaris, the temple has been improved, and a very large temple is now being constructed so that the mosque is now appearing diminished in comparison. Many archeological discoveries have been made there, and many people from foreign countries are beginning to appreciate Krishna’s birthplace. This Krishna consciousness movement is attracting many foreigners to the Keshavaji temple, and now they will also be attracted by the Krishna–Balarama temple in Vrindavana. When Sri Chaitanya Mahaprabhu chanted, danced and made loud vibrations, all the people were astonished to see His ecstatic love. One brahmana fell at the lotus feet of Sri Chaitanya Mahaprabhu and then began to dance with Him in ecstatic love. All the people then began to chant, “Hari! Hari!”and there was a great uproar. The priest in Lord Keshava’s service offered Sri Chaitanya Mahaprabhu a garland. The people said, “Simply by seeing Sri Chaitanya Mahaprabhu, everyone is maddened with love of Krishna. Indeed, everyone is laughing, crying, dancing, chanting and taking the holy name of Krishna. After this, Sri Chaitanya Mahaprabhu took the brahmana aside. Sitting in a solitary place, the Lord began to question him. The brahmana replied, “His Holiness Srila Madhavendra Puri came to the city of Mathura while he was on tour. “While at Mathura, Sripada Madhavendra Puri visited my house and accepted me as a disciple He even took lunch at my home. As soon as Chaitanya Mahaprabhu heard about Madhavendra Puri’s relationship with the brahmana, He immediately offered obeisances at his feet. Becoming fearful, the brahmana also immediately fell at the Lord’s feet. Upon hearing this, the brahmana became afraid. He then said, “Why do You speak like this? You are a sannyasi. “Upon seeing Your ecstatic love, I can just imagine that You must have some relationship with Madhavendra Puri. This is my understanding. Balabhadra Bhattacharya then explained the relationship between Madhavendra Puri and Sri Chaitanya Mahaprabhu. After hearing this, the brahmana became very pleased and began to dance. The brahmana then took Sri Chaitanya Mahaprabhu to his home and, out of his own free will, began to serve the Lord in various ways. He asked Balabhadra Bhattacharya to cook Sri Chaitanya Mahaprabhu’s lunch. At that time the Lord, smiling, spoke as follows. This is a quotation from the Bhagavad-gita (3.21). The brahmana belonged to the Sanodiya brahmana community, and a sannyasi does not accept food from such a brahmana. In northwestern India, vaishyas are divided into various subdivisions. Srila Bhaktivinoda Thakura points out that they are divided as Agarwala, Kalawara and Sanwada. Out of them, the Agarwalas are said to be first-class vaishyas, and the Kalawaras and Sanwadas are considered lower due to their occupational degradation. The Kalawaras generally take wine and other intoxicants. Although they are vaishyas, they are considered to belong to a lower class. The priests who guide the Kalawaras and the Sanwadas are called Sanodiya brahmanas. Srila Bhaktivinoda Thakura states that the word sanoyada in Bengal indicates suvarna-vanik. In Bengal there are priests who guide the suvarna-vanik community, which is also considered a low class. There is little difference between the Sanwadas and the suvarna-vaniks. Generally the suvarna-vaniks are bankers dealing in gold and silver. In western India, the Agarwalas also belong to the banking profession. This is the original business of the suvarna-vanik or Agarwala community. Historically, the Agarwalas came from the up-country named Ayodha, and the suvarna-vanik community also came from Ayodha. It therefore appears that the suvarna-vaniks and the Agarwalas belong to the same community. The Sanodiya brahmanas were the guides of the Kalawaras and Sanwadas. They are therefore considered to be lower-class brahmanas, and a sannyasi is not allowed to take alms or food from them. However, Sri Chaitanya Mahaprabhu accepted lunch cooked by a Sanodiya brahmana simply because he belonged to Madhavendra Puri’s community. Srila Madhavendra Puri was the spiritual master of Ishvara Puri, who was the spiritual master of Sri Chaitanya Mahaprabhu. Thus a spiritual relationship is established on the spiritual platform, without consideration of material inferiority or superiority. Although the brahmana belonged to the Sanodiya community, Srila Madhavendra Puri had seen that he behaved like a Vaishnava and had therefore accepted him as his disciple. The food he had cooked had also been accepted by Madhavendra Puri. Therefore Sri Chaitanya Mahaprabhu willingly requested food from the brahmana, and the brahmana, feeling natural humility, began to speak as follows. “It is a great fortune for me to offer You food. You are the Supreme Lord, and being in the transcendental position, You are not restricted in any way. Srila Bhaktisiddhanta Sarasvati Thakura remarks that although the brahmana did not belong to a superior community, he fearlessly chastised so-called caste brahmanas because he was situated on the platform of pure devotional service. There are people who are opposed to Sri Chaitanya Mahaprabhu’s accepting a Vaishnava belonging to a lower caste. Such people do not consider maha-prasadam transcendental, and therefore they are described here as murkha (foolish) and dushta (mischievous). A pure devotee has the power to challenge such high-caste people, and his brave statements are not to be considered proud or puffed up. On the contrary, he is to be considered straightforward. Such a person does not like to flatter high-class brahmanas who belong to the non-Vaishnava community. Sri Chaitanya Mahaprabhu replied, “The Vedas, Puranas and great learned sages are not always in agreement with one another. Consequently there are different religious principles. Unless one comes to the Absolute Truth, there is no possibility of agreement. Nasav rishir yasya matam na bhinnam: it is said that a great learned scholar or sage cannot be exalted unless he disagrees with other scholars and sages. On the material platform, there is no possibility of agreement; therefore there are different kinds of religious systems. But the Absolute Truth is one, and when one is situated in the Absolute Truth, there is no disagreement. On that absolute platform the Supreme Personality of Godhead is worshipable. As stated in the Bhagavad-gita (18.55), bhaktya mam abhijanati yavan yash chasmi tattvatah. On the absolute platform, the worshipful Deity is one, and the process of worship is also one. That process is bhakti. On this platform there is nothing but the service of the Lord. When a person has no ulterior motive, there is certainly oneness and agreement of principles. Since everyone has a different body and mind, different types of religions are needed. But when one is situated on the spiritual platform, there are no bodily and mental differences. Consequently on the absolute platform there is oneness in religion. Thus on the material platform animalistic leaders are worshiped by animals. Sometimes physicians, psychiatrists and social workers try to mitigate bodily pain, distress and fear, but they have no knowledge of spiritual identity and are bereft of a relationship with God. Yet they are considered mahajanas by the illusioned. Self-deceived persons sometimes accept leaders or spiritual masters from a priestly order that has been officially appointed by the codes of material life. In this way, they are deceived by official priests. Sometimes people accept as mahajanas those who have been designated by Srila Vrindavana dasa Thakura as dhanga-vipras (imposter brahmanas). Such imposters imitate the characteristics of Srila Haridasa Thakura, and they envy Haridasa Thakura, who was certainly a mahajana. They make great artificial endeavors, advertising themselves as great devotees of the Lord or as mystic hypnotists knowledgeable in witchcraft, hypnotism and miracles. Sometimes people accept as mahajanas demons like Putana, Trinavarta, Vatsa, Baka, Aghasura, Dhenuka, Kaliya and Pralamba. Some people accept imitators and adversaries of the Supreme Personality of Godhead, such as Paundraka, Srigala Vasudeva, the spiritual master of the demons (Sukracharya), or atheists like Carvaka, King Vena, Sugata and Arhat. People who accept such imitators as mahajanas have no faith in Sri Chaitanya Mahaprabhu as the Supreme Personality of Godhead. Rather, they accept godless cheaters who present themselves as incarnations of God and cheat foolish people within the material world by word jugglery. Thus many rascals are accepted as mahajanas. In this material world, karmis (fruitive actors) are accepted as mahajanas by foolish people who do not know the value of devotional service. The mundane intelligence and mental speculative methods of such foolish people are under the control of the three modes of material nature. Consequently they cannot understand unalloyed devotional service. They are attracted by material activities, and they become worshipers of material nature. Thus they are known as fruitive actors. They even become entangled in material activities disguised as spiritual activities In the Bhagavad-gita such people are described as veda-vada-ratah, supposed followers of the Vedas. They do not understand the real purport of the Vedas, yet they think of themselves as Vedic authorities. People versed in Vedic knowledge must know Krishna as the Supreme Personality of Godhead. Vedaish ca sarvair aham eva vedyah (Bg. 15.15). The conclusion is that all pious activity, fruitive activity, religious principles and renunciation must ultimately lead to devotional service. There are different types of processes for rendering service. One may serve his country, people and society, the varnashrama-dharma system, the sick, the poor, the rich, women, demigods and so on. All this service comes under the heading of sense gratification, or enjoyment in the material world. It is most unfortunate that people are more or less attracted by such material activity and that the leaders of these activities are accepted as mahajanas, great ideal leaders. Actually they are only misleaders, but an ordinary man cannot understand how he is being misled. Narottama dasa Thakura says, sadhu-shastra-guru-vakya, cittete kariya aikya: “One should accept as one’s guide the words of the sadhus, the shastra and the guru.”A sadhu is a great personality like Sri Chaitanya Mahaprabhu, the shastras are the injunctions of revealed scriptures, and the guru, or spiritual master, is one who confirms the scriptural injunctions. Accepting the guidance of these three is the actual way of following the great personalities (mahajanas) for real advancement in life (personally followed the behavior of Madhavendra Puri and advised others to follow his principles. Unfortunately, people have been attracted to the material body since time immemorial. People are so unfortunate that they do not accept the instructions of the Supreme Personality of Godhead. Instead, they want to be supported by so-called mahajanas, or authorities.Tate chaya darshana haite -tattva’ nahi jani: we cannot ascertain the real truth simply by following speculators. We have to follow the footsteps of the mahajanas in the disciplic succession. Then our attempt will be successful. Sri-krishna-chaitanya-vani–amritera dhara: “Whatever is spoken by Sri Chaitanya Mahaprabhu is an incessant flow of nectar.”Whoever accepts His words as reality can understand the essence of the Absolute Truth. No one can ascertain the Absolute Truth by following the philosophy of Sankhya or the yoga system of Patanjali, for neither the followers of Sankhya nor the yogis who follow Patanjali accept Lord Vishnu as the Supreme Personality of Godhead (na te viduh svartha-gatim hi vishnum [Bhag 7.5.31]). The ambition of such people is never fulfilled; therefore they are attracted by the external energy. Although mental speculators may be renowned all over the world as great authorities, actually they are not. Such leaders are themselves conservative and not at all liberal. However, if we preach this philosophy, people will consider Vaishnavas very sectarian Srila Madhavendra Puri was a real mahajana, but misguided people cannot distinguish the real from the unreal. But a person who is awakened to Krishna consciousness can understand the real religious path chalked out by the Lord and His pure devotees. Sri Madhavendra Puri was a real mahajana because he understood the Absolute Truth properly and throughout his life behaved like a pure devotee. Sri Chaitanya Mahaprabhu approved the method of Sri Madhavendra Puri. Therefore, although from the material viewpoint the Sanodiya brahmana was on a lower platform, Sri Chaitanya Mahaprabhu considered him situated on the highest platform of spiritual realization. Srimad-Bhagavatam (6.3.20) states that there are twelve mahajanas: Brahma, Narada, Shambhu, the four Kumaras, Kapila, Manu, Prahlada, Janaka, Bhishma, Bali, Shukadeva and Yamaraja. To select our mahajanas in the Gaudiya-sampradaya, we have to follow in the footsteps of Sri Chaitanya Mahaprabhu and His representatives. His next representative is Sri Svarupa Damodara Goswami, and the next representatives are the six Goswamis—Sri Rupa, Sri Sanatana, Bhatta Raghunatha, Sri Jiva, Gopala Bhatta and Dasa Raghunatha. A follower of Vishnu Swami’s was Sridhara Swami, the most well known commentator on Srimad-Bhagavatam. He was also a mahajana. Similarly, Candidasa, Vidyapati and Jayadeva were all mahajanas. One who tries to imitate the mahajanas just to become an imitative spiritual master is certainly far away from following in the footsteps of the mahajanas. Sometimes people cannot actually understand how a mahajana follows other mahajanas. In this way people commit offenses and fall from devotional service. After this discussion, the brahmana served lunch to Sri Chaitanya Mahaprabhu. Then all the people residing in Mathura came to see the Lord. People came by the hundreds of thousands, and no one could count them. Therefore Sri Chaitanya Mahaprabhu came out of the house to give audience to the people. Sri Chaitanya Mahaprabhu bathed in the twenty-four ghatas along the banks of the Yamuna, and the brahmana showed Him all the places of pilgrimage. The twenty-four ghatas (bathing places) along the Yamuna are (1) Avimukta, (2) Adhirudha, (3) Guhya-tirtha, (4) Prayaga-tirtha, (5) Kanakhala-tirtha, (6) Tinduka, (7) Surya-tirtha, (8) Vata-svami, (9) Dhruva-ghata, (10) Rishi-tirtha, (11) Moksha-tirtha, (12) Bodha-tirtha, (13) Gokarna, (14) Krishna-ganga, (15) Vaikuntha, (16) Asi-kunda, (17) Catuh-samudrika-kupa, (18) Akrura-tirtha, (19) Yajnika-vipra-sthana, (20) Kubja-kupa, (21) Ranga-sthala, (22) Manca-sthala, (23) Mallayuddha-sthana and (24) Dashashvamedha. Sri Chaitanya Mahaprabhu visited all the holy places on the bank of the Yamuna, including Svayambhu, Vishrama-ghata, Dirgha Vishnu, Bhuteshvara, Mahavidya and Gokarna. When Sri Chaitanya Mahaprabhu wanted to see the various forests of Vrindavana, He took the brahmana with Him. Sri Chaitanya Mahaprabhu visited the different forests, including Madhuvana, Talavana, Kumudavana and Bahulavana. Wherever He went, He took His bath with great ecstatic love. The word vana means “forest.”Vrindavana is the name given to the forest where Srimati Vrindadevi (Tulasidevi) grows profusely. Actually it is not a forest as we ordinarily consider a forest, because it is very thick with green vegetation. There are twelve such vanas in Vrindavana. Some are located on the western side of the Yamuna, and others are on the eastern side. The forests situated on the eastern side are Bhadravana, Bilvavana, Lauhavana, Bhandiravana and Mahavana. On the western side are Madhuvana, Talavana, Kumudavana, Bahulavana, Kamyavana, Khadiravana and Vrindavana. These are the twelve forests of the Vrindavana area. When Sri Chaitanya Mahaprabhu passed through Vrindavana, herds of grazing cows saw Him pass and, immediately surrounding Him, began to moo very loudly. Seeing the herds approach Him, the Lord was stunned with ecstatic love. The cows then began to lick His body out of great affection. Becoming pacified, Sri Chaitanya Mahaprabhu began to caress the cows, and the cows, being unable to give up His company, went with Him. It was only with great difficulty that the cowherd men were able to keep the cows back. Then when the Lord chanted, all the deer heard His sweet voice and approached Him. When the does and bucks came and saw the Lord’s face, they began to lick His body. Not being at all afraid of Him, they accompanied Him along the path. Bumblebees and birds like the parrot and cuckoo all began to sing loudly on the fifth note, and the peacocks began to dance in front of the Lord. Upon seeing Sri Chaitanya Mahaprabhu, the trees and creepers of Vrindavana became jubilant. Their twigs stood up, and they began to shed tears of ecstasy in the form of honey. The tree branches and creepers, overloaded with fruits and flowers, fell down at the lotus feet of the Lord and greeted Him with various presentations as if they were friends. Thus all the moving and nonmoving living entities of Vrindavana became very jubilant to see the Lord. It was as if friends were made happy by seeing another friend. Seeing their affection, the Lord was moved by ecstatic love. He began to sport with them exactly as a friend sports with his friends. Thus He voluntarily came under the control of His friends. Sri Chaitanya Mahaprabhu began to embrace each and every tree and creeper, and they began to offer their fruits and flowers as if in meditation. All moving and nonmoving creatures then began to vibrate the transcendental sound of Hare Krishna, as if they were echoing the deep sound of Chaitanya Mahaprabhu. The Lord then clasped the necks of the deer and began to cry. There was jubilation manifest in the bodies of the deer, and tears were in their eyes. When a male and female parrot appeared on the branches of a tree, the Lord saw them and wanted to hear them speak. Both parrots flew onto the hand of the Lord and began to chant the transcendental qualities of Krishna, and the Lord listened to them. This verse is found in the Govinda-lilamrita (13.29). After hearing this description of Lord Krishna from the male parrot, the female parrot began to recite a description of Srimati Radharani. This verse is also found in the Govinda-lilamrita (13.30). Thereafter the male parrot said, “Krishna is the enchanter of the mind of Cupid.”He then began to recite another verse. This verse is also found in the Govinda-lilamrita (13.31). Then the female parrot began to speak jokingly to the male parrot, and Sri Chaitanya Mahaprabhu was struck with wonderful ecstatic love to hear her speak. This is another verse from the Govinda-lilamrita (13.32). When the Lord saw the bluish necks of the peacocks, His remembrance of Krishna immediately awakened, and He fell to the ground in ecstatic love. When the brahmana saw that Sri Chaitanya Mahaprabhu was unconscious, he and Balabhadra Bhattacharya took care of Him. They hastily sprinkled water over the Lord’s body. Then they took up His outer cloth and began to fan Him with it. They then began to chant the holy name of Krishna into the Lord’s ear. When the Lord regained consciousness, He began rolling on the ground. When the Lord rolled on the ground, sharp thorns injured His body. Taking Him on his lap, Balabhadra Bhattacharya pacified Him. The mind of Sri Chaitanya Mahaprabhu wandered in ecstatic love of Krishna. He immediately stood up and said, “Chant! Chant!”Then He Himself began to dance. Being thus ordered by the Lord, both Balabhadra Bhattacharya and the brahmana began to chant the holy name of Krishna. Then the Lord, dancing and dancing, proceeded along the path. The brahmana was astounded to see the symptoms of ecstatic love exhibited by Sri Chaitanya Mahaprabhu. He then became anxious to give the Lord protection. Sri Chaitanya Mahaprabhu’s mind was absorbed in ecstatic love at Jagannatha Puri, but when He passed along the road on the way to Vrindavana, that love increased a hundred times. The Lord’s ecstatic love increased a thousand times when He visited Mathura, but it increased a hundred thousand times when He wandered in the forests of Vrindavana. When Sri Chaitanya Mahaprabhu was elsewhere, the very name of Vrindavana was sufficient to increase His ecstatic love. Now, when He was actually traveling in the Vrindavana forest, His mind was absorbed in great ecstatic love day and night He ate and bathed simply out of habit. Thus I have written a description of the ecstatic love Lord Chaitanya manifested in one of the places He visited while walking through the twelve forests of Vrindavana. To describe what He experienced everywhere would be impossible. Lord Ananta writes millions of books elaborately describing the transformations of ecstatic love experienced by Sri Chaitanya Mahaprabhu in Vrindavana. Since Lord Ananta Himself cannot describe even a fragment of these pastimes, I am simply pointing out the direction. The whole world became merged in the inundation of the pastimes of Sri Chaitanya Mahaprabhu. One can swim in that water to the extent that he has the strength. Praying at the lotus feet of Sri Rupa and Sri Raghunatha, always desiring their mercy, I, Krishnadasa, narrate Sri Chaitanya-charitamrita, following in their footsteps. 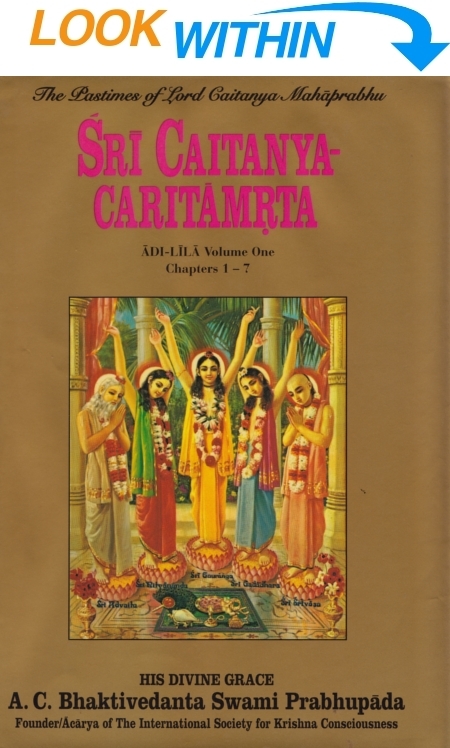 Sri Chaitanya-charitamrta,by Srila Krishnadasa Kaviraja Goswami, is the principal work on the life and teachings of Sri Krishna Chaitanya Mahaprabhu. Chaitanya Mahaprabhu is the pioneer of a great social and religious movement that began in India about five hundred years ago and that has directly and indirectly influenced the subsequent course of religious and philosophical thinking not only in India but throughout the world. That Sri Krishna Chaitanya’s influence has spread so far is due in large part to the efforts of His Divine Grace A. C. Bhaktivedanta Swami Prabhupada, the present work’s translator and commentator and the founder and acharya (spiritual guide) of the International Society for Krishna Consciousness. Chaitanya Mahaprabhu is thus a figure of great historical significance. However, our conventional method of historical analysis—that of seeing a man as a product of his times—fails here, for Sri Krishna Chaitanya is a personality who transcends the limited scope of historical settings. At a time when, in the West, man was directing his explorative spirit toward studying the structure of the physical universe and circumnavigating the world in search of new oceans and continents, Sri Krishna Chaitanya, in the East, was inaugurating and masterminding a revolution directed toward a scientific understanding of the highest knowledge of man’s spiritual nature. The chief historical sources for the life of Sri Krishna Chaitanya are the kadachas (diaries) kept by Murari Gupta and Svarupa Damodara Goswami. Murari Gupta, a physician and close associate of Sri Krishna Chaitanya’s, recorded extensive notes on the first twenty-four years of His life, culminating in His initiation into the renounced order, sannyasa. The events of the rest of Chaitanya Mahaprabhu’s forty-eight years were recorded in the diary of Svarupa Damodara Goswami, another of His intimate associates. Sri Chaitanya-charitamrita is divided into three sections, called lilas, a word that literally means “pastimes”—the Adi-lila (recounting the early period of Lord Chaitanya’s pastimes), the Madhya-lila (recounting the middle period), and the Antya-lila (recounting the final period). The notes of Murari Gupta form the basis of the Adi-lila, and Svarupa Damodara’s diary provides the details for the Madhya– and Antya-lilas. The first twelve chapters of the Adi-lilaconstitute the preface for the entire work. By referring to Vedic scriptural evidence, Krishnadasa Kaviraja establishes that Chaitanya Mahaprabhu is the avatara (incarnation) of God for the Age of Kali—the current epoch, which began five thousand years ago and is characterized by materialism, hypocrisy, and dissension. The author also proves that Chaitanya Mahaprabhu is identical to Lord Krishna and explains that He descends to liberally grant the fallen souls of this degraded age pure love of God by propagating sankirtana—literally, “congregational glorification of God”—especially by organizing massive public chanting of the maha-mantra: Hare Krishna, Hare Krishna, Krishna Krishna, Hare Hare/ Hare Rama, Hare Rama, Rama Rama, Hare Hare. In addition, in the twelve-chapter preface Krishnadasa Kaviraja reveals the esoteric purpose of Lord Chaitanya’s appearance in the world, describes His co-avataras and principal devotees, and summarizes His teachings. In the remaining portion of the Adi-lila, chapters thirteen through seventeen, the author briefly recounts Lord Chaitanya’s divine birth and His life until He accepted the renounced order. This account includes His childhood miracles, schooling, marriage, and early philosophical confrontations, as well as His organization of a widespread sankirtana movement and His civil disobedience against the repression of the Muslim government. The Madhya-lila, the longest of the three divisions, narrates in detail Lord Chaitanya’s extensive and eventful travels throughout India as a renounced mendicant, teacher, philosopher, spiritual preceptor, and mystic. During this period of six years, Sri Chaitanya Mahaprabhu transmits His teachings to His principal disciples. He debates and converts many of the renowned philosophers and theologians of His time, including Sankarites, Buddhists, and Muslims, and incorporates their many thousands of followers and disciples into His own burgeoning numbers. The author also includes in this section a dramatic account of Chaitanya Mahaprabhu’s miraculous activities at the giant Ratha-yatra (Car Festival) in Jagannatha Puri, Orissa. The Antya-lila concerns the last eighteen years of Sri Chaitanya’s presence, spent in semiseclusion near the famous Jagannatha temple in Puri. During these final years, Sri Krishna Chaitanya drifted deeper and deeper into trances of spiritual ecstasy unparalleled in all of religious and literary history, Eastern or Western. His perpetual and ever-increasing religious beatitude, graphically described in the eyewitness accounts of Svarupa Damodara Goswami, His constant companion during this period, clearly defy the investigative and descriptive abilities of modern psychologists and phenomenologists of religious experience. The author of this great classic, Krishnadasa Kaviraja Goswami, born around the beginning of the sixteenth century, was a disciple of Raghunatha dasa Goswami, a confidential follower of Chaitanya Mahaprabhu’s. Raghunatha dasa, a renowned ascetic saint, heard and memorized all the activities of Chaitanya Mahaprabhu told to him by Svarupa Damodara Goswami. After the passing away of Sri Chaitanya Mahaprabhu and Svarupa Damodara, Raghunatha dasa, unable to bear the pain of separation from these objects of his complete devotion, traveled to Vrindavana, intending to commit suicide by jumping from Govardhana Hill. In Vrindavana, however, he encountered Srila Rupa Goswami and Srila Sanatana Goswami, two of the most confidential disciples of Chaitanya Mahaprabhu. They convinced him to give up his planned suicide and impelled him to reveal to them the spiritually inspiring events of Lord Chaitanya’s later life. Krishnadasa Kaviraja Goswami was also residing in Vrindavana at this time, and Raghunatha dasa Goswami endowed him with a full comprehension of the transcendental life of Sri Chaitanya Mahaprabhu. By this time, contemporary and near-contemporary scholars and devotees had already written several biographical works on the life of Sri Krishna Chaitanya Mahaprabhu. These included Sri Chaitanya-charita, by Murari Gupta, Chaitanya-mangala, by Locana dasa Thakura, and Chaitanya-bhagavata. This latter work, by Vrindavana dasa Thakura, who was then considered the principal authority on Sri Chaitanya’s life, was highly revered. While composing his important work, Vrindavana dasa, fearing that it would become too voluminous, avoided elaborately describing many of the events of Sri Chaitanya Mahaprabhu’s life, particularly the later ones. Anxious to hear of these later pastimes, the devotees in Vrindavana requested Krishnadasa Kaviraja Goswami, whom they respected as a great saint and scholar, to compose a book narrating these episodes in detail. Upon this request, and with the permission and blessings of the Madana-mohana Deity of Vrindavana, he began compiling Sri Chaitanya-charitamrita, which, due to its literary excellence and philosophical thoroughness, is today universally regarded as the foremost work on the life and profound teachings of Sri Chaitanya Mahaprabhu. Krishnadasa Kaviraja Goswami commenced work on the text at a very advanced age and in failing health, as he vividly describes in the text itself: “I have now become too old and disturbed by invalidity. While writing, my hands tremble. I cannot remember anything, nor can I see or hear properly. Still I write, and this is a great wonder.” That he completed the greatest literary gem of medieval India under such debilitating conditions is surely one of the wonders of literary history. As mentioned above, this English translation and commentary is the work of His Divine Grace A. C. Bhaktivedanta Swami Prabhupada, the world’s most distinguished teacher of Indian religious and philosophical thought. Srila Prabhupada’s commentary is based upon two Bengali commentaries, one by his guru, Srila Bhaktisiddhanta Sarasvati Goswami, the eminent Vedic scholar, teacher, and saint who predicted, “The time will come when the people of the world will learn Bengali to read Sri Chaitanya-charitamrita,” and the other by Srila Bhaktisiddhanta Sarasvati’s father, Srila Bhaktivinoda Thakura, who pioneered the propagation of Sri Chaitanya Mahaprabhu’s teachings in the modern era. Srila Prabhupada is himself a disciplic descendant of Sri Chaitanya Mahaprabhu, and is the first scholar to execute systematic English translations of the major works of Sri Chaitanya Mahaprabhu’s followers. His consummate Bengali and Sanskrit scholarship and intimate familiarity with the precepts of Sri Krishna Chaitanya are a fitting combination that eminently qualifies him to present this important classic to the English-speaking world. The ease and clarity with which he expounds upon difficult philosophical concepts enable even a reader totally unfamiliar with the Indian religious tradition to understand and appreciate this profound and monumental work. The entire text, with commentary, presented by the Bhaktivedanta Book Trust, represents a contribution of major importance to the intellectual, cultural, and spiritual life of contemporary man. There is no difference between the teachings of Lord Chaitanya presented here and the teachings of Lord Krishna in the Bhagavad-gita. The teachings of Lord Chaitanya are practical demonstrations of Lord Krishna’s teachings. Lord Krishna’s ultimate instruction in Bhagavad-gita is that everyone should surrender unto Him, Lord Krishna. Krishna promises to take immediate charge of such a surrendered soul. Sri Chaitanya-charitamrita is the authorized work on the life and teachings of Sri Krishna Chaitanya—the philosopher, saint, spiritual preceptor, mystic and divine incarnation who pioneered a great social and religious movement in sixteenth-century India. His teachings, which embody the highest philosophical and theological truths, have influenced countless philosophical and religious and thinkers up to the present day. This translation of the original Bengali text, along with commentary, is the work of His Divine Grace A. C. Bhaktivedanta Swami Prabhupada, the world’s most distinguished scholar and teacher of India thought and culture and author of the best-selling Bhagavad-gita As It Is. This translation of Sri Chaitanya-charitamrita represents a contribution of major importance to the intellectual, cultural and spiritual life of contemporary man. It would not be inaccurate to say that Sri Chaitanya-charitamrita is one of the most important works of historical and philosophical literature ever written in any language. It is the principal work on the life and teaching of Sri Krishna Chaitanya, the Supreme Personality of Godhead Himself in human form. Sri Krishna Chaitanya is the pioneer of a great social and religious movement that began in India in the early sixteenth century and that directly and indirectly influenced the subsequent course of religious and philosophical thinking not only in India but throughout the world. At a time when, in the West, man was directing his explorative spirit toward circumnavigating the world in search of new oceans and continents and toward studying the structure of the physical universe, Sri Krishna Chaitanya, in the East, was inaugurating and masterminding a revolution directed toward inward, toward a scientific understanding of the highest knowledge of man’s spiritual nature. Within His lifetime, Sri Krishna Chaitanya transformed the face of India in four respects: philosophically, by encountering, defeating and converting the greatest philosophers and thinkers of His day; religiously, by organizing the largest, most widespread theistic movement in India’s history; socially, by His strong challenges against the religious inequities of the caste system; politically, by His organization of a massive civil disobedience movement in Bengal, more than four centuries before Gandhi. The text is divided into three sections, called “lilas.” The Adi-lila traces Sri Krishna Chaitanya’s life from birth through His acceptance of the renounced order, sannyasa, at the age of twenty-four. This part includes His childhood miracles, schooling, marriage and early philosophical confrontations, as well as His organization of the widespread sankirtana movement and His civil disobedience against the repression of the Muslim government. The Madhya-lila, the longest of the three sections, contains a detailed narration of Sri Krishna Chaitanya’s extensive and eventful travels throughout India as a renounced mendicant, teacher, spiritual preceptor and mystic. Finally, the Antya-lila concerns the last eighteen years of Chaitanya Mahaprabhu’s manifest presence, spent in semiseclusion in Jagannatha Puri, Orissa. During those years, Sri Krishna Chaitanya drifted deeper and deeper into trances of spiritual ecstasy unparalleled in all of religious and literary history, Eastern or Western. Krishnadasa Kaviraja Goswami, the author of Sri Chaitanya-charitamrita, was a great saint and confidential disciple of Raghunatha dasa Goswami, the renowned ascetic saint who was one of the most intimate disciples of Sri Krishna Chaitanya. Krishnadasa Kaviraja began work on the text at a very advanced age and in failing health, as he vividly describes in the text itself: “I have now become too old and disturbed by invalidity. While writing, my hands tremble. I cannot remember anything, nor can I see or hear properly. Still I write, and this is a great wonder.” That he completed the greatest literary gem of medieval India under such debilitating conditions is surely one of the wonders of literary history. The English translation and commentary is the work of His Divine Grace A. C. Bhaktivedanta Swami Prabhupada, the world’s most distinguished scholar and teacher of India religious and philosophical thought. He himself is a disciplic descendent of Sri Krishna Chaitanya, and his intimate familiarity with the percepts Chaitanya Mahaprabhu taught eminently qualifies him to present this important classic to the English-speaking world. The ease and clarity with which he expounds Sri Krishna Chaitanya’s teachings enable even a reader totally unfamiliar with the India religious tradition to understand and appreciate this profound and monumental work.